The Linking Communities Project is the collaborative efforts of Nature Canada, Chaplin Tourism Association and Nature Saskatchewan to protect populations of shared bird species through education, outreach, research, monitoring and applied conservation. The Linking Communities Project funders are Kennecott Utah Copper Corp, Rio Tinto, and Birdlife International. The project is part of Birdlife Americas Programme. The conservation objectives of this partnership are to assess the status of the key sites for state and pressure, protect the habitat integrity of the Western Hemisphere Shorebird Reserve Network or WHSRN and Important Bird Area sites, and the birds that they support. Partners participate fully in range-wide efforts to conserve these species. Through education and outreach, we will create awareness and interest in birds, the WHSRN and IBA sites, and the international aspects of the Linking Communities project. We foster a commitment to promote conservation to the citizens of southern Saskatchewan, and to develop a cadre of conservation stewards in the local population. With monitoring and research we hope to be able to develop and implement methods to monitor populations of key species and address other questions relevant to their ecologies and population status and trends by engaging interested institutions in Saskatchewan. Students from Swift Current to Moose Jaw, tourists, and the general public will be the target audience of this project. The geographic focus of the project are the IBAs of Chaplin Lake, Reed Lake and Old Wives Lake in south-western Saskatchewan, with the broader scope to include a large catchment area extending out 150 km for educational efforts and outreach, and the birding trail that includes Last Mountain Lake and Quill Lakes. Shared/linking species: American Avocet, Wilson's Phalarope, White Pelican, Franklin's Gull. IBA Trigger Species: Piping Plover, Red Knot. 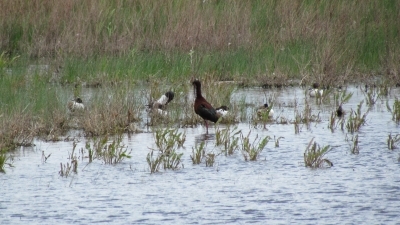 Common Species to Chaplin/Reed/Old Wives: Stilt Sandpiper, Baird's Sandpiper, Semipalmated Sandpiper and Sanderling. Several lakes and wetlands in south-western Saskatchewan are of great importance for several shorebird and water bird species which pass through the Great Salt Lake in Utah on their way to wintering areas in Mexico including Marismas Nacionales and other locations further south. After the designation of Western Hemisphere Shorebird Reserve Network (WHSRN ) sites in the mid- 1990s, Chaplin Tourism with the support of several partners including Saskatchewan Minerals, TransCanada Corporation, Ducks Unlimited, and other groups, developed the Chaplin Nature Centre on Chaplin Lake along the TransCanada highway. The purpose of the Nature Centre is to raise awareness and interest both locally and with Canadians about the significance of this area for shorebirds, waterbirds and waterfowl and the "linking communities" project. Many supporters have provided generously to the Centre, including staffing it with interpretive naturalists during the summer. It is estimated that the Centre itself is visited by 10,000 people annually, including local schools. As well, the community has been involved in the teacher exchanges with Great Salt Lake and Marismas Nacionales and developed some common curricula to link schools in these three anchors of the birds' ranges. 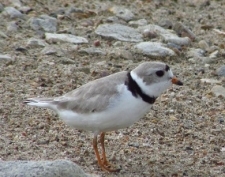 Birds in the area have been monitored over the years by both local birders and in the case of the endangered Piping Plover, by Canadian Wildlife Service biologists. In 2001, a conservation plan was written for Chaplin, Reed and Old Wives Lake as part of the Important Bird Area program. In 2009, a WHSRN site assessment was conducted on the three sites by CWS staff. Nature Saskatchewan has recruited "Caretakers" for these IBAs in the past year. One of the roles that Caretakers are encouraged to take on is to monitor the trigger species of birds to the best of their abilities. This project identifies and addresses education and outreach, conservation and stewardship, monitoring and research and ecotourism components to bring the project on-line with its southern partners and raise its profile within Canada and Saskatchewan. Lori Wilson from Morse, Saskatchewan, is the IBA Caretaker for Reed Lake, and plays a key role in the Chaplin Tourism and Nature Centre. She and teacher Michael Francis travelled to Great Salt Lake, Utah, from May 14th to May 21st, 2012, to meet with other Linking Communities representatives from United States and Mexico, and visit Great Salt Lake and area. See the following link for stories and video from their wonderful trip.